Monchique is best visited on foot. A walk through the steep streets of the town centre is rewarded with views of magnificent hills, glimpsed between houses, and moments of sunlit calm in unsuspected corners. It leaves a memory of a hill town with a history and character all its own and instills a strong, desire to return. Algarve architecture - white walls, carved stonework, bands of colou raround doors and windows - but their saia (literally skirt ) chimneys are quire distinct from those found on the coast. The narrow streets that wind up the steep hillside, revealing fresh views of verdant hills at at every turn, lend the town a certain exoticism to which camellias, hydrangeas and fruit trees add a fragrant suggestions of gardens and orchards. 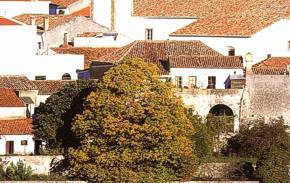 An opportunity to discover a facet of the Algarve unlike any other. 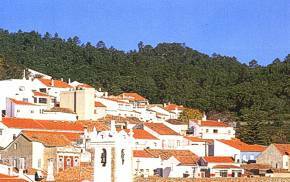 To appreciate fully how pretty Monchique is, head for the Largo de São Sebastião. The white houses look as if they are perched on steps carved into the hillside. amid a fairytale setting of bright flowers and cool, green trees. Raised in the 15th/16th centuries, the church was rebuilt following the earthquake of 1755. The main entrance is in the Manueline style decorated with cogiolos at its five corners and masks between its columns. The side doorways, which are plainer,. date from the same period. The interior is made up of three naves. The capitals of the columns are fashioned in the shape of twisted ropes, repeating the decorative theme of the main entrance. In the main chapel is a carved and gilded retable (18th century) that is quite distinctive in design: on the arch are two angels holding up the sun and the moon, while a curious pair of atlantes support the ensemble as a whole. There is an interesting tabernacie in the form of a miniature church. The statue of Nossa Senhora da Conceição is attributed to the sculptor Machado de Castro. 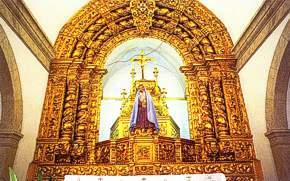 The Capela do Santíssimo (Chapel of the Most Holy) has a small collection of 17th century tiles. In addition to an interesting collection of statues, the church also houses a number of ceremonial objects which once belonged to the monastery of Nossa Senhora de Desterro (Our Lady of Exile. The carvings on the altar, pulpit and baldaquin in this church are its chief artistic attractions, together with two large 18th century canvasses and the panels carried in religious processions. This small chapel, topped with two bell towers, evinces the unassuming style of popular architecture. Inside ther is a life size statue of Christ.